I always wind down right before Thanksgiving. Winding down this year includes finalizing projects, closing the books for 2009, and writing a list of needed changes and implementation strategies for 2010. This year I sent a 72 page genealogy Christmas booklet to ColorMark, the local professional printer, the Monday before Thanksgiving. Right on time. I’ve already finalized the printer’s proof, and when the printed pages are complete it will be bound in burgundy leatherette with gold foil typeset from Engle Bindery. My goal is to deliver it to the customer the first week of December, but at least it is off my desk. Because I like to eat, I did take on a small freelance job, writing for an online Genealogy magazine (Genealogy Archives). This is the only project I have for the month of December with the deadline of December 19. Then off to holiday heaven. Although I will enjoy a short vacation from the cold weather, in Kansas City, I go into hibernation in the winter due to breathing issues that are exacerbated when exposed to the cold weather (and the heat, and wind, and too much pollen – you get the picture). But, it’s during this time of being locked up in the home/office, that I get to do research, finish the last chapter of the Morris book, make changes to and publish the Tinberg Tales, and work on my to do lists. Ah yes the “to do list.” I keep it for 12 months of the year, and tackle as much as I can between December 19 and the planting of the onions season. Here in KC that is March. 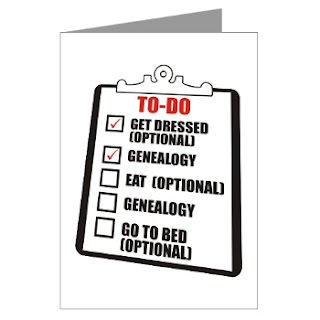 I will update forms, research conferences, work on blog topics, close up personal genealogy projects, work out volunteer efforts at the Mid-Continent Genealogy Center in Independence, schedule spring/summer speaking events, etc. All of this, in addition to working on new/repeat customer projects that pays the bills, must be accomplished between the planting of garlic (Dec) and the planting of onions (Mar). The best part about the winter months for me, is I get extra hours in the day, since I’m limited on distractions. I love snowy cold days…work, work, work. It’s my most productive time of the year. And I hope it will be yours too. Start planning now and began listing all of your definite, hopeful, and maybe projects now! Hope you make the best of winter!